Taylor & Colledge is an Australian company with a history spanning more than 100 years. In 1897, Taylor and Colledge won its first award for excellence in vanilla. Since then, the Taylor and Colledge commitment for unsurpassed quality has earned its reputation as one of the world’s finest vanilla producers. 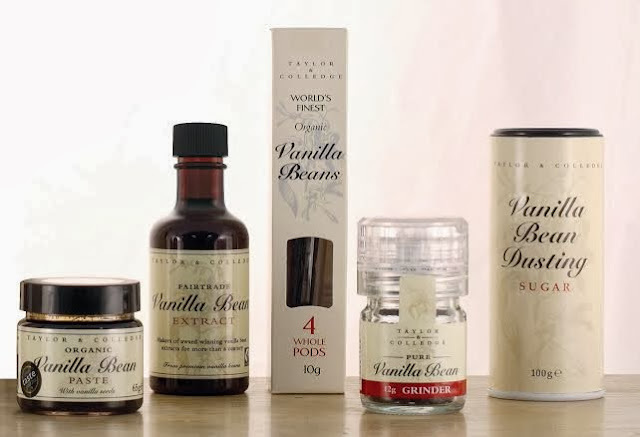 One lucky reader will win a years supply of these 5 vanilla products, worth more than £60. If you like to bake or you know someone who does, then this is a fabulous prize. 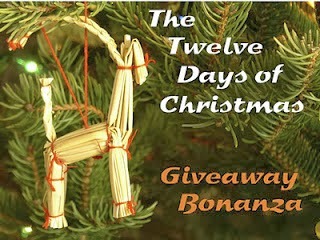 It's really simple to enter, just leave a comment, then add your entry to the rafflecopter box below. This giveaway is UK only and runs until 28 December 2013. The winner will be announced on 29 December 2013. Disclosure: Taylor & Colledge are providing a years supply of vanilla products for one lucky reader. I was not required to write a positive review and any opinions expressed are my own. Ohhhh I adore vanilla - love to eat it and smell it! I use vanilla essence in my scones - adds a nice touch. what wonderful products, I would love to have these available in my kitchen. Those looks lovely and I would be thrilled to use them. I think vanilla is an underrated spice and I have been muttering for ages about trying to use it more and in more versatile ways. Really ought to get to it! Yummy - especially the vanilla paste! Nice prize. Will get me back into making puds. Ooo, these look yummy - deffo could make use of the dusting sugar in my baking! The vanilla bean dusting sugar sounds amazing! I love baking and I love vanilla!! These look wonderful,lots of tasty baking! Wow! A real vanilla fest! Wonderful! I'm desperate to try vanilla bean paste but have never been able to afford it! A fab cupboard staple for any foodie! This would transform my baking. These look great. I always end up using the cheaper supermarket essences as the good stuff costs so much but you can tell the difference. Ooooh I could bake a lot of cakes with them! Vanilla bean paste was a revelation to me - it's so much better than any other form of vanilla flavouring. It's so expensive though! Fab prize, i love the vanilla bean paste i use it in my cakes and biscuits its lovely! oooh the amazing treats i could make with these! Fab giveaway, vanilla is lush! This would be great for baking! wow, i could make some lovely things with these! I use vanilla extract a lot. That is a lot of different vanilla forms. I would definitely need to hunt recipes to use some of them! I love vanilla extract but have never tried using vanilla bean paste - sounds amazing! These look amazing. Love vanilla. I love the smell of vanilla, but anyone remember that awful BodyShop vanilla perfume that every teenage girl was, by law, required to wear in the early 90s? Shudder. Vanilla makes such a difference to baking and vanilla in custard is lovely. I use lots of vanilla, love it in cakes, biscuits, creme brulee, milkshake, allsorts yummy! Vanilla is probably my favourite flavour! Such a useful range of Vanilla products, thanks. Amazing prize, thinking of all the baking I could do if I won! Gobsmacked - it would be such a treat to be able to use these products. Love the smell of vanilla. I love vanilla.. great givaway! What a wonderful prize! It'd go to great use in my house! Always add vanilla to my sponge cake recipes, delicious! Love the smell of vanilla, supposedly it is supposed to reduce hunger pangs by sniffing it??? Brilliant selection - love using vanilla bean paste in my baking! Love vanilla and use loads, so this would be a fab prize for me! Vanilla is definitely a favourite flavour. I love vanilla, I even like putting some in my green tea! What a fab prize. Who doesn't love vanilla? Yum! Sure I could use up the whole supply quickly as want to try making some scented candles with it, as well as ice cream and rice pudding! I love the taste of vanilla, would love to try using it straight from the pod. Vanilla is one of those heavenly items we can't live without. Fabulous prize, I need more vanilla in my life! Merry Christmas and a very vanilla new year! I love vanilla too, what a gorgeous prize! Always amazes me how many recipes need vanilla - how do people manage to cook without it? This looks like an amazing prize. I have heard lots of great things about these products. Fingers crossed! Would love to win this prize, we add vanilla to all sorts of things we make at home.